Born in Toronto, Ontario, the son of Frieda (Humme) and Percy Roberts. His mother was an artist in her own right who had studied under J.W.L. Forster. Her father was Julius Humme, an original member of the Ontario Society of Artists. Tom’s father, Percy, was for many years proprietor of the Roberts Art Gallery and his father in turn was Samuel Roberts, who founded the gallery in 1842. From early boyhood, Tom spent considerable time at the gallery and had early ambitions of becoming an artist. Later he studied three years at the Central Technical School, Toronto, under Peter Haworth, Charles Goldhammer, Robert Ross and Carl Schaeffer; one year at Ontario College of Art under F.S. Challener, J.W. Beatty, Yvonne McKague Housser and Fred Haines. By 1928 he was established as a free-lance artist in the fields of commercial and fine art. He painted landscapes on the spot mainly out-of-doors which were selected for Christmas cards by Rous and Mann Limited, Coutts Limited, Warwick Brothers and the Montreal firm of A.S. Fysche Company. He filled commissions for decorative maps, posters drawings in black-and-white for reproduction, and lettering. He did his easel painting in water colours, oils and later acrylics, for his varied subject matter of northern landscapes, town and country scenes in Ontario and subjects in Quebec and the Maritimes. He also did interiors and experimental painting. His influences were derived from French Impressionists, Group of Seven and J.W. 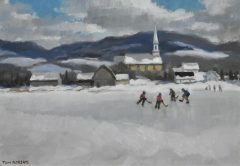 Beatty in particular, who had preceded the Group of Seven in the discovery of Northern Ontario for subject matter. Beatty had influenced Tom Thomson in his use of brighter colours and as a teacher inspired his students to use a brighter palette. During World War Two Roberts served with the Royal Canadian Engineers as a sapper (1942-43) assigned to architectural drafting. In his spare time he portrayed army life with quick pencil sketches and water colour paintings. After a year in the army he was able to return to civilian life and resume his career as a full-time artist. At his studio he held an informal showing in December, 1943, of work done during his army service. This occasion was noted by a Toronto Telegram reviewer as follows, He has completed several interesting watercolor sketches, illustrative of army life, these successfully animated – ‘Mopping Up Operations’ for example, and a kitchen scene. Most important are his oils, in especial those of the Petawawa River and the beautiful country drained thereby. These show a new freedom in the Roberts’ brush work, an increasing breadth of style, a newly vigorous color. The lovely amber, brown, blue and green lights in the translucent waters of the Petawawa have greatly intrigued the artist. . . . A small oil, main interest of which is wheat, magnificently gold in the sunlight, is quite striking in quality. The artist has done interesting things with clouds and with light and shadow on snow. In 1944 Roberts won the Ralph, Clarke, Stone Award at the O.S.A. annual. Over the years he moved towards simpler designs and abstracted compositions. His rural scenes were enriched with children on their way to and from school or at their play in all seasons. Other subjects included rural workers or vacationers. 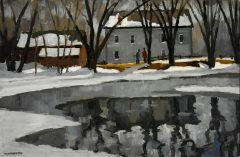 His unpeopled rural scenes were painted on locations across Canada but often in Ontario. He is well known for his winding woodland roads edged with maple, birch, spruce and pine. In his more modern compositions like Village Variations (coil. Univ. Western Ont.) he renders geometric patterns gently superimposed, one upon the other. In the foreground a public wharf juts out into calm reflective waters. The wharf curves back towards the middle distance to rectangular buildings and windows behind which a rural church with spiked tower stands like a sentinel overlooking the rest of the village and finally in the background curved patches of trees and sky complete the picture. Although Roberts employs these geometric elements, he still manages to create a gentle restful scene. There are aspects of this painting that are slightly reminiscent of American painters, Feininger and Sheeler but Roberts maintains feelings of warmth, humanity and reality which are apparent in all his landscapes. Viewing his work in 1970 Jenny Bergin of The Ottawa Citizen noted, Warns stonework, gentle snow and deep, dark water seem to be Mr. Roberts’ first love, their undemanding appeal lying somewhere between his ‘painterly’ approach to a subject (frequently murdered by cliches of scorching whites and blues) and his firm calm handling. It is clear that a good deal of old-fashioned concern for draughtsmanship has gone into the works, with the quiet pleasure of one who knows his ‘trade.’ It appears that any change of heart after the event would be unthinkable to Mr. Roberts, for his painting feels fresh and well-considered. Colors are obviously selected with great care, then applied as an irretrievable statement, as in watercolor. In the collection of 38 works, ‘Fordwich’ is particularly attractive for its still atmosphere and that quiet, reflective winter light when the sky is still heavy with snow. Roberts’ lithographs are also well known to the public. By the mid 1980’s he had held over thirty one-man shows in Toronto alone. 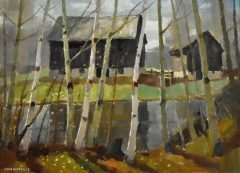 A member of the Ontario Society of Artists (1944) and an Associate Member of the Royal Canadian Academy (1945) he has been a regular contributor to their exhibitions over the years as well as the C.N.E., and public galleries across the country. His work is displayed by dealers in Vancouver, London, Hamilton, Toronto, Ottawa, Halifax and elsewhere. 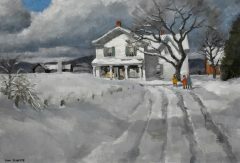 His later solo shows include: Eaton’s Art Gallery, Tor. (1964) (1974) (1975) (1982) (1984) (1985); Wallack Galleries, Ott. (1970) (1973) (1975) (1977); Continental Gallery, Mtl. (1975); Manuge Gallery, Hal. (1977) (1983). He is represented in the following collections: London Public Library and Art Museum, Ont. ; University of Western Ontario, Lond. ; Art Gallery of Hamilton, Ont. ; The Ontario Collection, Tor. ; New Galbraith Bldg., Univ. Tor. ; Ford Motor Company; Imperial Oil, Tor. ; Canadian Imperial Bank of Commerce; The University of Guelph Art Collection, Ont. ; Seagram Collection, Mtl. and many other collections public and private. plus numerous public & private collections in Canada and the U.S.A.